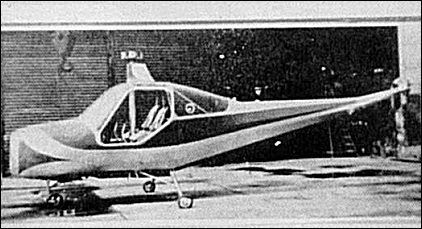 The Beija-Flor is a small two-seat helicopter which was designed and built by the Department to the initial design of Professor Heinrich Focke, who holds a number of patents concerning some of the original features of the helicopter. 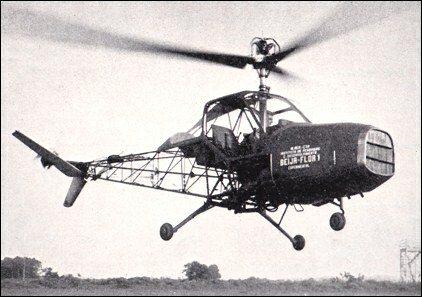 The Beija-Flor is the first helicopter to be designed, built and flown in Brazil and was first flown early in 1959 by Colonel Aldo Vieira da Rosa, a Brazilian Air Force officer and present director of the Instituto de Pesquisas e Desenvolvimento da Aeronautica. The forward-located 225hp Continental E225 engine drives the main and tail rotors through a centrifugal clutch and a David Brown lorry worm and wheel. The main rotor incorporates a mechanical-hydraulic automatic stabilising mechanism which reduces flapping to zero in the pitch direction. Roll control is provided by normal "swash-plate" movement. Pitch and yaw control is provided by the unique V-type intermeshing twin tail rotor which also serves to incline the main rotor plane for forward flight. For economic reasons the material used in the construction of the helicopter is almost entirely of national origin and due to the relatively undeveloped state of the aircraft and accessory industry in Brazil this has unavoidably led to an excessive weight. This situation will however be improved with subsequent prototypes now being planned. The first flights have concentrated on a preliminary assessment of control and stability and have been remarkably fie-of prototype ""snags". The results so far have been extremely satisfactory. The BF-1 Beija Flor was designed in 1956 by Professor Focke at the Centre Tecnico de Aeronautica at the military research and overhaul centre at Sao Jose dos Campos. A two-seater, the Beija Flor had its 225hp Continental E225 engine fitted in the nose, with a short coupling to the rotor pylon which was mounted centrally in front of the crew. An open structure tubular steel tail boom carried a pair of tail surfaces and a small tail rotor. The prototype flew on 1 January 1959, and went through extended flight testing until it was damaged in an accident. It is thought that further work on the Beija Flor was then abandoned. Yes...Those VTOL-VSTOL Projects were designed by Prof. Focke. He was the Designer and Fly Testing Pilot of those aircrafts. Prof. Focke flew many times with the Beija-flor and Convertplane. The projects were developed only by the Fase A Project. No industry were interested into the homologation and production of the Beija-flor and Convertplane as weell at that time.